Fresh from last weekend’s handsewn Christmas ornament workshop: here are the decorations we made. 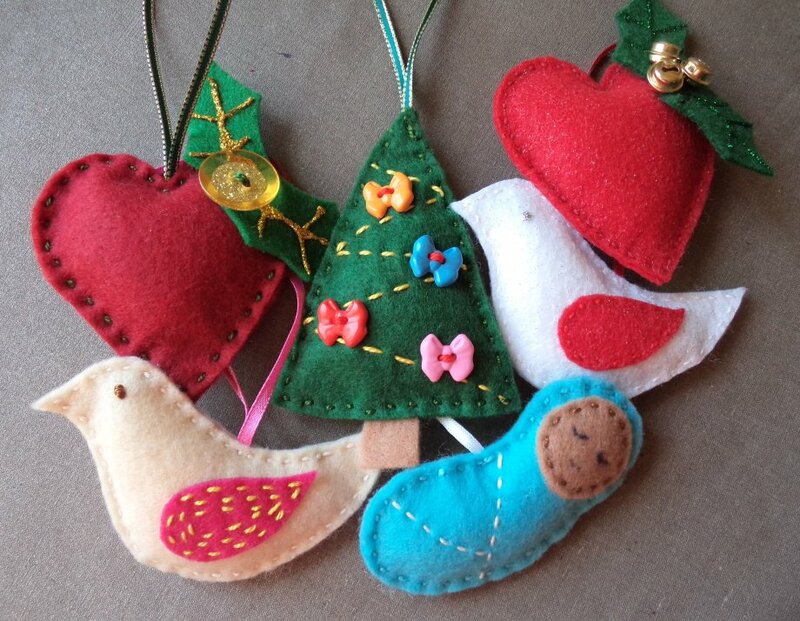 There’s a tree, dove, love heart and baby Jesus. 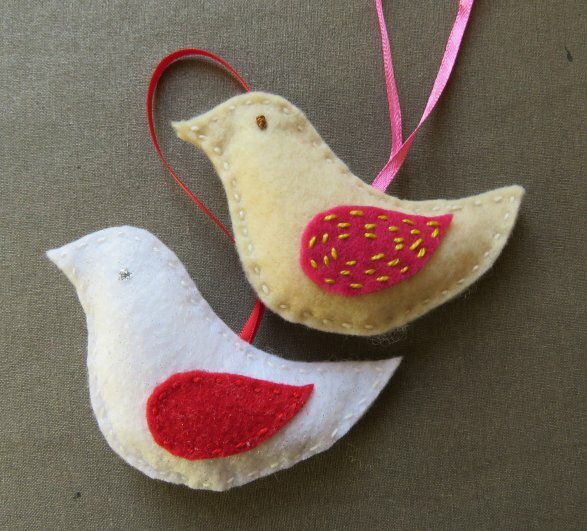 All are crafted from felt using running stitch. They are very simply made, since the workshop was only 90 minutes long. 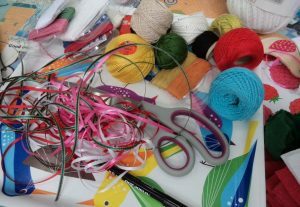 Everyone finished one or two things (all beautifully and creatively) and took the others to do at home. They’ll print out on a single A4 sheet. Thread. Pearl cotton or shaskio thread. Pearl cotton is preferable since it has a slight lustre which works better for Christmas ornaments. It looks best if you can keep your stitch length under 4mm and use a colour thread that matches the felt (otherwise your stitches will have to be very neat). Stuffing. Each ornament is stuffed with a very small amount of polyester stuffing (about the size of one or two walnuts). The stuffing is inserted near the end of the stitching, and a pair of hemostats makes it easier to get the stuffing in there. Avoid stuffing too firmly. An assortment of buttons and bells. 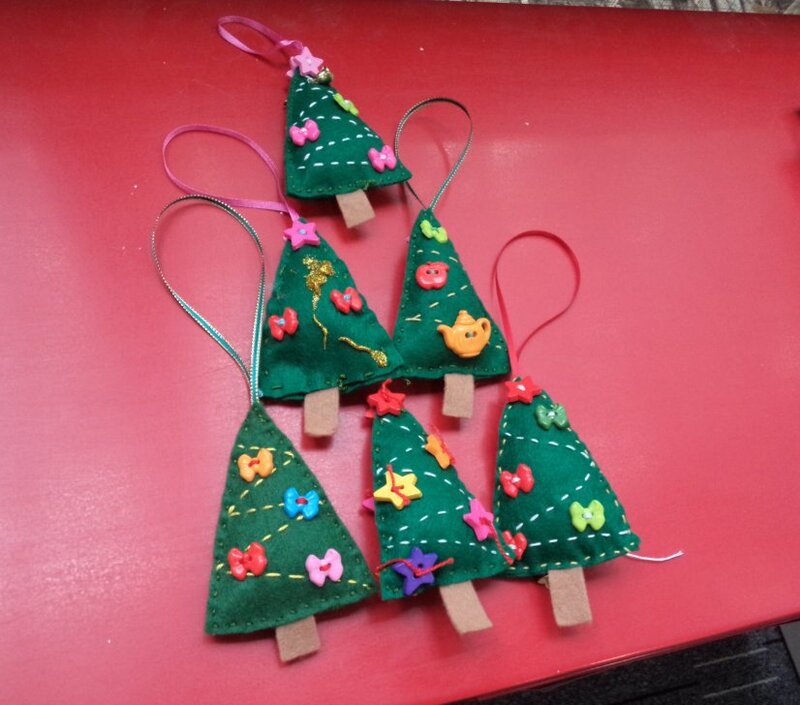 Loops of fine ribbon to hang the ornaments. Glitter glue. Use it to add detail BUT do this last – the glue takes a long time to dry. Tree. I made mine different on each side, and so did everyone else. 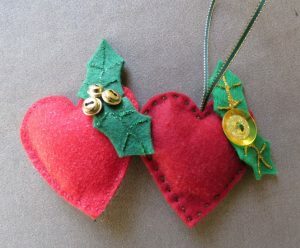 Stitch the “tinsel” first, add the buttons, then sew around the edges. Stitch in a strip of felt for the trunk and a hanging loop of ribbon at the same time. 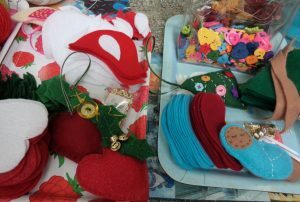 Here are some made by the workshop participants, two of whom were in primary school. Love heart. Stitch the holly and bells/button on first, then keep on stitching around the heart. Don’t forget the hanging loop (I did!). Use the glitter glue last of all, since it takes ages to dry. Birds. Note that you’ll need a pair of wings and bird bodies. Sew the wings on first, either with fancy stitches or just around the edges. The eye can be a French knot (do first) or a dob of glitter glue (do last). 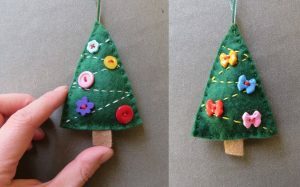 When all the embellishment is done, sew around the edges adding in the hanging loop. Baby Jesus. Don’t forget the reason for the season! You’ll need a pair of bodies. I made mine the same back and front but the back could be plain. 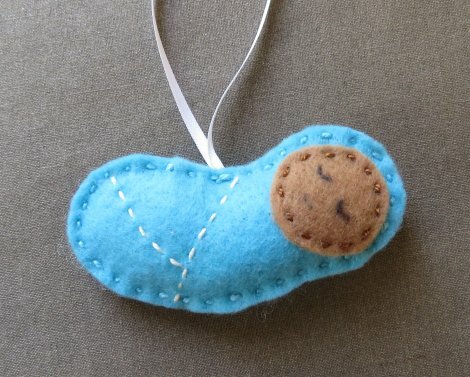 Sew some running stitches to represent swaddling. Stitch on the face and draw in the eyes and mouth with a fine tipped pen. Finally stitch around the edges, adding in the hanging loop. Here are the materials we used for the workshop. Bags of decorative buttons were really useful for the trees -we tipped them out on trays to go through. While the felt was all pre-cut (by me), there were different types of ribbon, bells and thread for artistic freedom.